GASTONIA, NC – The Gastonia Fire Department was dispatched at 12:06 pm on Wednesday, April 20, 2016 to a commercial business fire at 1620 East Ozark Avenue. In shortly over a minute, the first arriving firefighters were on scene to a commercial brick building with heavy smoke and fire conditions. The fire officers quickly determined that the building was more than 50% involved with fire and for the safety of all, instructed the fire companies to fight the fire from a defensive mode. It took 23 firefighters nearly 30 minutes to get the fire under control. This was a box alarm so there were three engine companies, one ladder company, one heavy rescue company and five Chief Officers. The front portion of the building was being used as a church. The Gastonia Fire Department’s Fire Investigation Task Force is investigating the fire. 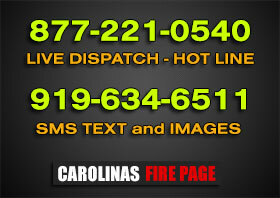 Submitted by Fire Inspector Jim Landis, Gastonia Fire Department.